Gothic as a form of fiction-making has played a major role in Western culture since the late eighteenth century. 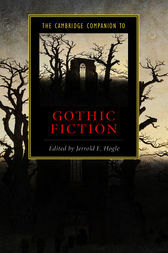 In this volume, fourteen world-class experts on the Gothic provide thorough and revealing accounts of this haunting-to-horrifying type of fiction from the 1760s (the decade of The Castle of Otranto, the first so-called 'Gothic story') to the end of the twentieth century (an era haunted by filmed and computerized Gothic simulations). Along the way, these essays explore the connections of Gothic fictions to political and industrial revolutions, the realistic novel, the theatre, Romantic and post-Romantic poetry, nationalism and racism from Europe to America, colonized and post-colonial populations, the rise of film and other visual technologies, the struggles between 'high' and 'popular' culture, changing psychological attitudes towards human identity, gender and sexuality, and the obscure lines between life and death, sanity and madness. The volume also includes a chronology and guides to further reading.